Seen passing the Ashton Buoy after her second visit to Greenock - the first was at the beginning of July - Princess Cruises' CROWN PRINCESS was heading for Invergordon as she made her way round the British coast on a 12-night cruise from Southampton. 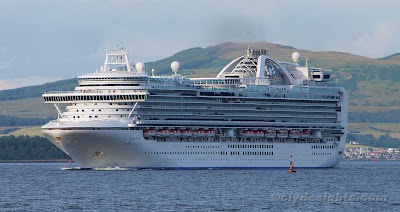 CROWN PRINCESS is one of the Clyde's largest visitors at 113,651 gross tons, and 290 metres in length. She was completed in 2006 at the Fincantieri yard at Monfalcone and can carry up to 3,080 passengers. The second ship in the Princess Cruises fleet to use the name, her predecessor was featured here recently as A'ROSA BLU.